As you make your way through Chennai, you will realize that the city is full of quaint, Dravidian-style temples that are home to some local deities like Lord Murugan or Vishnu as well as the mist-worshipped Indian ones Lord Shiva and Ganesh. 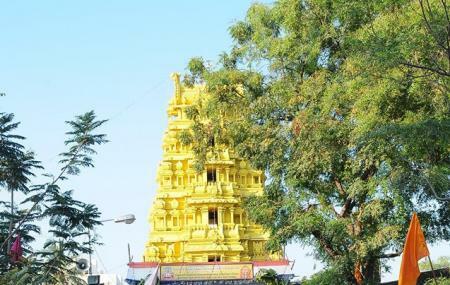 This particular temple is one dedicated to Lord Shiva, built during the reign of the Pallava dynasties. It was further remodelled during the Chola reign. This temple holds high significance owing to the belief that the lingham here was installed by Lord Yama or the God of Death. How popular is Dhandeeswaram Temple? People normally also visit Varasidi Vinayakar Temple while planning their trip to Dhandeeswaram Temple. Old temple renovated recently. Nice please. Sashtiappthapurthi is done here. A place of worship Lord Shiva . Ancient temple with it's old temple architecture . Great peace when get in . Annadhanam offered by temple committed is really worthfull to public as seen . Very auspicious place. Have positive vibration. History: Demon Somasura snatched the Vedas from Lord Brahmma. Lord Vishnu recovered them from the demon. As the vedas stayed with the demon for some time, their sanctity was lost. They performed penance on lord Shiva to become as pure and holy as they were earlier. Lord Shiva purified the vedas with their original glory. As vedas worshipped here, the place was called vadacherry, which in the days that followed changed as velacherry.The scriptural name is Vedasreni. Miracle based Features: Lord Veerabadra graces the devotees in a sitting form. The rays of sun fall on the Shivalinga on the first day of the Thai Tamil month. As soon as you enter the temple we feel lot of vibration as well as heavenly place. During prodosam time cow milk only allowed. Good temple tank. A very ancient temple in the heart of Velacherry. Landmark is Gandhi road bus stop. Near the bus stop you can view the big temple tank. During JJ govt they resulted the tank and are maintaining till now nicely.